Cambridge won a controversial 150th Boat Race on Sunday, bringing an end to two years of Oxford dominance. The Dark Blues started well, surging into a slight lead, only for Cambridge to pull back immediately. Oxford lost a length after both boats clashed on the Fulham bend and never looked likely to regain the ground, despite a brave effort. The Dark Blues appealed the result following the race, but Cambridge's victory was upheld by the race umpire. The result pushes Cambridge into a 78-71 lead in the series with one race in 1877 ending in a dead heat. Our bowman came off his seat and could not continue properly - it was race over after that. The race proved to be a nightmare for Oxford, whose bowman Chris Kenelly stopped rowing twice in quick succession. It left his team struggling badly and ultimately proved the difference between the boats. 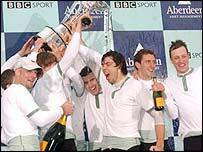 Oxford cox Acer Nethercott told BBC Sport: "We were going strong side by side, we were warned and then there was a massive crash. "Our bowman came off his seat and could not continue properly - it was race over after that. "I'm prepared to accept that we were in their water, but that happens in the Boat Race. You see a gap and you fill it. "At one stage, I thought the referee was going to uphold our appeal, but he decided to leave the race as it was. "It's bitterly disappointing to have the 150th Boat Race decided like that, but hats off to Cambridge much as it sticks in my throat to say that." Referee James Behrens defended his decision not to uphold Oxford's complaint. "Oxford were off station and I was warning them, that left me with no option," he said. "It's a shame that it happened. If they had stayed in their water it could have been a good race." Cambridge: C Le Neve Foster, K Coventry, H Mallinson, S Mayer, A Shannon, S Buschbacher, N Kirk, W Pommen, K Richardson (cox). Oxford: C Kennelly, B Dixon, A Stubbs, J Scrogin, P Reed, D Livingston, H Morris, C Smith, A Nethercott (cox). "We had been practising clashing"
"It was a foul in every sense"
"It's a shame that it happened"